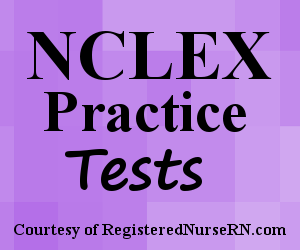 This is a quiz that contains NCLEX review questions for acute kidney injury (also called acute renal failure). As a nurse providing care to a patient with AKI, it is important to know the signs and symptoms, pathophysiology, nursing management, patient education, and treatment for these conditions. Don’t forget to watch the acute kidney injury lecture before taking the quiz. This quiz will test your knowledge on Acute Kidney Injury (also called Acute Renal Failure) in preparation for NCLEX. A. A 45 year old male with a renal calculus. B. A 65 year old male with benign prostatic hyperplasia. C. A 25 year old female receiving chemotherapy. D. A 36 year old female with renal artery stenosis. E. A 6 year old male with acute glomerulonephritis. F. An 87 year old male who is taking an aminoglycoside medication for an infection. A. A 56 year old male who has metabolic acidosis, decreased GFR, increased BUN/Creatinine, hyperkalemia, edema, and urinary output 350 mL/day. B. A 45 year old female with metabolic alkalosis, hypokalemia, normal GFR, increased BUN/creatinine, edema, and urinary output 600 mL/day. C. A 39 year old male with metabolic acidosis, hyperkalemia, improving GFR, resolving edema, and urinary output 4 L/day. D. A 78 year old female with respiratory acidosis, increased GFR, decreased BUN/creatinine, hypokalemia, and urinary output 550 mL/day. 1. ______________ is solely filtered from the bloodstream via the glomerulus and is NOT reabsorbed back into the bloodstream but is excreted through the urine. The answer is B. Creatinine is a waste product from muscle breakdown and is removed from the bloodstream via the glomerulus of the nephron. It is the only substance that is solely filtered out of the blood but NOT reabsorbed back into the system. It is excreted out through the urine. This is why a creatinine clearance test is used as an indicator for determining renal function and for calculating the glomerular filtration rate. The answers are A and C. The glomerular filtration rate indicates how well the glomerulus is filtering the blood. A normal GFR tends to be 90 mL/min or higher. A GFR of 40 mL/min indicates that the kidney’s ability to filter the blood is decreased. Therefore, the kidneys will be unable to remove waste and excessive water from the blood…hence hypervolemia and an increased BUN level will present in this patient. The patient will experience HYPERkalemia (not hypo) because the kidneys are unable to remove potassium from the blood. In addition, an INCREASED creatinine level (not decreased) will present because the kidneys cannot remove excessive waste products, such as creatinine. 3. You’re assessing morning lab values on a female patient who is recovering from a myocardial infraction. Which lab value below requires you to notify the physician? The answer is B. A normal creatinine clearance level in a female should be 85-125 mL/min (95-140 mL/min males). A creatinine clearance level indicates the amount of blood the kidneys can make per minute that contain no amounts of creatinine in it. Remember creatinine is a waste product of muscle breakdown. Therefore, the kidneys should be able to remove excessive amounts of it from the bloodstream. A patient who has experienced a myocardial infraction is at risk for pre-renal acute injury due to decreased cardiac output to the kidneys from a damaged heart muscle (the heart isn’t able to pump as efficiently because of ischemia). All the other labs values are normal. 4. A 55 year old male patient is admitted with a massive GI bleed. The patient is at risk for what type of acute kidney injury? The answer is C. Pre-renal injury is due to decreased perfusion to the kidneys secondary to a cause (massive GI bleeding…patient is losing blood volume). This leads to a major decrease in kidney function because the kidneys are deprived of nutrients to function and the amount of blood it can filter. Pre-renal injury can eventually lead to intrarenal damage where the nephrons become damaged. 5. Select all the patients below that are at risk for acute intra-renal injury? The answers are: C, E, and F. These patients are at risk for an intra-renal injury, which is where there is damage to the nephrons of kidney. The patients in options A and B are at risk for POST-RENAL injury because there is an obstruction that can cause back flow of urine into the kidney, which can lead to decreased function of the kidney. The patient in option D is at risk for PRE-RENAL injury because there is an issue with perfusion to the kidney. 6. A patient with acute kidney injury has the following labs: GFR 92 mL/min, BUN 17 mg/dL, potassium 4.9 mEq/L, and creatinine 1 mg/dL. The patient’s 24 hour urinary output is 1.75 Liters. Based on these findings, what stage of AKI is this patient in? The answer is D. This patient is in the recovery stage of AKI. The patient’s labs and urinary output indicate the renal function has returned to normal. Remember the recovery stages starts when the GFR (glomerular filtration rate) has returned to normal (normal GFR 90 mL/min or higher), which will allow waste levels and electrolyte levels to be maintained. The answers are: B, C, and D. This patient is in the DIURESIS stage of AKI. The nephrons are now starting to filter out waste but cannot concentrate the urine. There is now a high amount of urea in the filtrate (because the nephrons can filter the urea out of the blood) and this causes osmotic diuresis. Urinary output will be excessive (3 to 6 L/day). Therefore, the patient is at risk for hypotension, diluted urine (low urine specific gravity), and hypokalemia (waste potassium in the urine). The patient is not at risk for water intoxication and will not have a normal GFR until the recovery stage. 8. True or False: All patients with acute renal injury will progress through the oliguric stage of AKI but not all patients will progress through the diuresis stage. The answer is FALSE. Some patients will skip the oliguric stage of AKI and progress to the diuresis stage. The answer is A. During the oliguric stage of AKI the patient will have a urinary output of 400 mL/day or LESS. This is due to a decreased GRF (glomerular filtration rate), which will lead to increased amounts of waste in the blood (increased BUN/Creatinine), metabolic acidosis (decreased excretion of hydrogen ions), hyperkalemia, hypervolemia (edema/hypertension), and urinary output of <400 mL/day. 10. You’re developing a nursing care plan for a patient in the diuresis stage of AKI. What nursing diagnosis would you include in the care plan? The answer is B. During the diuresis stage of AKI, the patient will be losing an excessive amount of urine (3-6 Liters/day) and is at risk for fluid volume deficient and electrolyte imbalance. The nurse must monitor the patient’s electrolyte levels, especially potassium (hypokalemia). 11. While educating a group of nursing students about the stages of acute kidney injury, a student asks how long the oliguric stage lasts. You explain to the student this stage can last? The answer is A. The oliguric stage can last 1-2 weeks. Regarding the other stages of AKI: Initiation: few hours to several days, diuresis: 1-3 weeks, and recovery: 12 months or more. 12. A patient with AKI has a urinary output of 350 mL/day. In addition, morning labs showed an increased BUN and creatinine level along with potassium level of 6 mEq/L. What type of diet ordered by the physician is most appropriate for this patient? The answer is C. The patient with AKI, especially in the oliguric stage of AKI, should eat a low-protein, low-potassium, and low-sodium diet. This is because the kidneys are unable to filter out waste products, excessive water, and maintain electrolyte balance. The patient will have a buildup of waste (BUN and creatinine). Remember these waste products are the byproduct of protein (urea) and muscle breakdown (creatinine). So the patient should avoid high-protein foods. In addition, the patient is at risk for hyperkalemia and fluid overload (needs low-potassium and sodium foods).